Interferon induced transmembrane protein 3 (IFITM3) is transcribed in most tissues and highly interferon-inducible. However, the role of IFITM3 in cancer is still poorly understood. 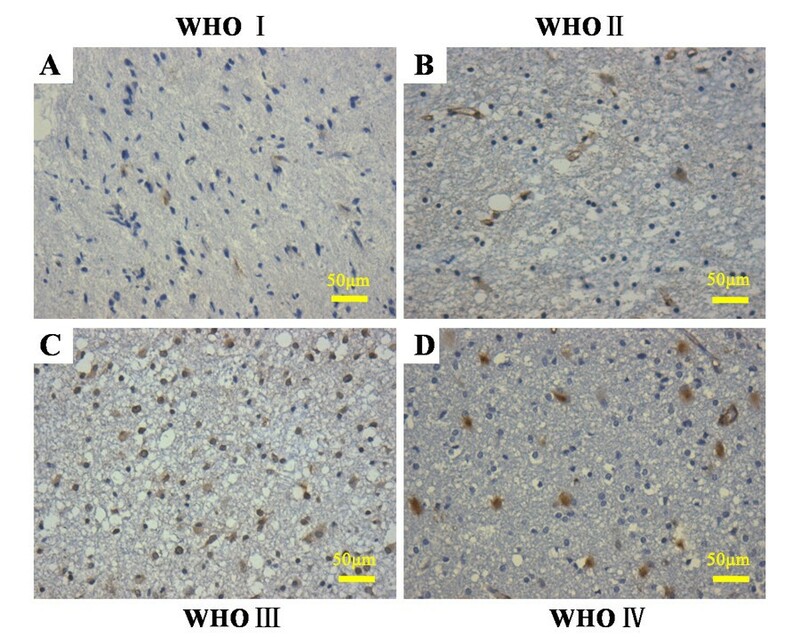 Expression levels ofIFITM3were analyzed in 60 glioma patients by immunohistochemistry (IHC). Following closely, we investigated the phenotype of IFITM3 knockdown on glioma cell growth and tumorigenesis in vitro using lentivirus-mediated loss-of-function strategy. Depletion of IFITM3in U251 cells dramatically inhibited cell proliferation and colony formation, which demonstrated that reduced IFITM3 protein levels could cause inhibition of tumorigenesis. Knockdown of IFITM3 also induced cell cycle arrest in G0/G1 phase, especially in the sub-G1 phase representing apoptotic cells. In addition, the migration of U251 cells was visibly weakened after IFITM3 knockdown, as determined by Transwell assay. Our findings provide new evidence that IFITM3 plays an important role in glioma cell growth and migration, suggesting that silencing of IFITM3 by RNA interference (RNAi) may be a potential approach to suppress glioma growth. Glioma is the most common neurosurgical Nerve tumor [1, 2]. At present, the prognosis of patients with malignant glioma remains very poor, and median survival is generally less than one year from the time of diagnosis, even in the most favorable situations, most patients die within two years [3, 4]. Numerous studies have shown that gliomas develop as a result of genetic alterations that accumulate with tumor progression and therefore show a great morphological and genetic heterogeneity. Primary and secondary glioblastomas represent distinct entities evolving through different genetic pathways, molecular profile and response to therapy . Therefore, new molecular targets and therapeutic strategies are urgently required for glioma therapy. Interferon induced transmembrane protein 3 (IFITM3, also known as 1-8U) was initially identified in a cDNA screen from INF-treated neuroblastoma cell back in 1984  and cloned from a human lymphoid cell cDNA library . IFITM3 is transcribed in most tissues and is highly interferon-inducible [7, 8]. Previous studies showed that IFITM3 belongs to a family of murine genes , which are short, 2-transmembrane-domain proteins (5-18 kDa) with high core sequence similarity but divergent N- and C-termini. The human homologues (IFITM1, IFITM2, and IFITM3) are clustered on chromosome 11 within an 18-kb genomic sequence [7, 10, 11], and mediates cellular processes, including cell adhesion, immune-cell regulation, germ-cell homing and maturation, and bone mineralization [8, 11–16]. Recent studies identified possible roles of IFITM genes in carcinogenesis. For example, IFITM1 and IFITM3 were shown to express at higher levels in astrocytoma cells than in normal astrocytes in mice [11, 17, 18]. Furthermore, IFITM1 was identified as a key player in both the carcinogenesis and invasion in patients with glioma . Also, IFITM2 played a crucial role as a p53 independent pro-apoptotic gene in regulating cancer cellular pathways to death . Researchers first isolated the IFITM3 gene from tumor tissue and severely inflamed mucosa in the colons of patients with ulcerative colitis, describing it as a preferential marker for ulcerative colitis-associated colon cancer [21, 22]. In addition, IFITM3 expression has been found to be up-regulated in gastric cancer, colorectal tumors, and so on [23–25]. In this study, we showed the positive correlation between the expression levels of IFITM3 and pathological grades of glioma by IHC. However, the precise function and underlying mechanism of IFITM3 in glioma pathogenesis remain unclear. To study the role of IFITM3 in glioma, we employed lentivirus-mediated short hairpin RNA (shRNA) to knock down IFITM3 in human glioma cell line U251. 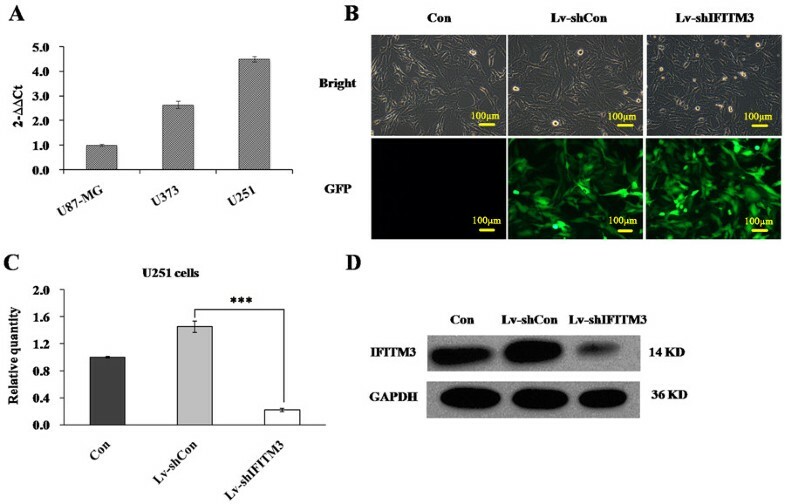 The effects of IFITM3 knockdown on cell growth and migration were investigated. Dulbecco’s modified Eagle’s medium (DMEM) and fetal bovine serum (FBS) were obtained from Hyclone (Logan, Utah, USA). Lipofectamine 2000, TRIzol® Reagent was purchased from Invitrogen (Carlsbad, CA, USA). M-MLV Reverse Transcriptase was purchased from Promega (Madison, WI, USA; cat. M1705). All other chemicals were obtained from Sigma (St. Louis, MO, USA). The antibodies used were as follows: anti-IFITM3 (1:50 dilution; Sigma/SAB1410086). We studied 60 glioma patients who had been surgically treated in Department of Neurosurgery, the Second Affiliated Hospital of Anhui Medical University, Hefei 230601, China. For IHC, 60 pairs of resected glioma tissues were fixed in 10% formalin solution and embedded in paraffin. Histological slices of 3 mm were prepared, then were deparaffined in xylene, and rehydrated with graded ethanol. Endogenous peroxidase was blocked with 0.3% H2O2 in methanol for 20 min at room temperature (RT). Following antigen retrieval, the sections were blocked with 5% BSA for 20 min at RT and then probed with 1:300 rabbit anti-IFITM3 at 4°C overnight. After washing, the sections were incubated with Histostain○R-Plus 3rd Gen IHC Detection Kit (Invitrogen/85–9073) at RT for 1 h, and visualized using the peroxidase conjugated streptavidin and diaminobenzidine, followed by counterstaining with Mayer’s haematoxylin. The IFITM3 antibody was replaced by PBS in negative controls. IHC staining were evaluated by a pathologist blinded to all clinical data. Samples were scored positive when more than 10% of the cells reacted with the anti-IFITM3 antibody and presented cytoplasm staining. Human glioma cell line U251 and human embryonic kidney cell line 293 T were obtained from American Type Culture Collection (ATCC). Cells were maintained in DMEM supplemented with 10% heat-inactivated FBS and 100 units/ml penicillin/streptomycin at 37°C in humidified atmosphere of 5% CO2. The following oligonucleotide was synthesized. The negative control small interfering RNA (siRNA) was 5′-TTCTCCGAACGTGTCACGT-3′. IFITM3 siRNA was 5′-GCTGGAATTCATGAATCACACTGTCCAAAC-3′. The stem-loop-stem oligos (shRNAs) were synthesized, annealed, and ligated into the Nhe I/Pac I-linearized pFH-L vector. The lentiviral-based shRNA-expressing vectors were confirmed by DNA sequencing. The generated plasmids were named as pFH-L-shIFITM3 or -shCon. Recombinant lentiviral vectors and packaging vectors were then transfected into 293 T cells. Supernatants containing lentivirus expressing IFITM3 shRNA or control shRNA were harvested 72 h after transfection. Then, the lentiviruses were purified using ultracentrifugation, and the titer of lentiviruses was determined. U251 cells were infected with the lentivirus constructs at multiplicity of infection (MOI) =10 and mock-infected cells were used as negative controls. To demonstrate specific knockdown of IFITM3, these experiments are also being repeated by using another two shRNAs (5′-CCAACTATGAGATGCTCAAGGCTCGAGCCTTGAGCATCTCATAGTTGGTTTTTT-3′ and 5′-CCTCATGACCATTCTGCTCATCTCGAGATGAGCAGAATGGTCATGAGGTTTTT-3′) against IFITM3 to get comparable results. Total RNA was extracted from U251 cells 5 days after infection using TRIzol® Reagent. cDNA was synthesized using M-MLV Reverse Transcriptase. In brief, a mixture containing 1.5 μg of total RNA, 0.75 μg oligo-dT primer (Shanghai Sangon) and nuclease-free water in a total volume of 13.5 μl was heated at 70°C for 5 min and then cooled on ice for another 5 min. The mixture was supplemented with 4 μl M-MLV buffer, 1.25 μl dNTP, 0.5 μl RNasin and 0.75 μl M-MLV-RT up to a final volume of 20 μl, followed by incubation at 42°C for 60 min. Real-time quantitative PCR analysis was performed using SYBR Green Master Mix Kit on BioRad connect Real-Time PCR platform. In brief, each PCR reaction mixture containing 10 μl of 2 × SYBR GreenMaster Mix, 1 μl of sense and antisense primers (5 μmol/μl) and 1 μl of cDNA (10 ng), was run for 45 cycles with denaturation at 95°C for 15 s, annealing at 60°C for 30 s and extension at 72°C for 30 s in a total volume of 20 μl. For relative quantification, 2-ΔΔCT was calculated and used as an indication of the relative expression levels, which was calculated by subtracting CT values of the control gene from the CT values of IFITM3. The primer sequences for PCR amplification of IFITM3 gene were 5′-TGTCCAAACCTTCTTCTCTCC-3′ and 5′-CGTCGCCAACCATCTTCC-3′. β-actin was applied as an internal control. The primer sequences of β-actin were 5′-GTGGACATCCGCAAAGAC-3′and 5′- AAAGGGTGTAACGCAA CTA-3′. U251 cells were trypsinized, resuspended, seeded into 96-well plate with a concentration of 2000 cells per well, and incubated at 37°C 3 days post lentivirus infection. The number of viable cells was measured at daily intervals (day 1, 2, 3, 4 and 5). At each time point, 10 μl of 5 mg/ml MTT (Dingguo Biotechnology) was added, and incubation was continued for 3 h. Then the medium was removed carefully and 100 μl of acidified isopropanol (in 0.01 M HCl) was added at the end of incubation. The absorbance was measured at 595 nm on the spectrophotometer. A total of 200 U251 cells were seeded in 6-well plates after 3 days of lentivirus infection. The medium was changed at regular time intervals. After 11 days of cultureat 37°C, the natural colonies were washed with PBS and fixed with 4% paraformaldehyde for 30 min at room temperature. The colonies were then stained with Giemsa for 10 min, washed with water and air-dried. The total number of colonies with more than 50 cells was counted under fluorescence microscopy. The cell cycle distribution was analyzed using flow cytometry with PI staining. In brief, 1.5 × 105 cells that infected with lentivirus for 4 days were seeded in 6-cm dishes and allowed to culture for 40 h at 37°C. Cells were harvested after tripsinization, washed with PBS, and fixed with 70% cold ethanol. Cells were then collected by centrifugation, resuspended in PBS containing 100 μg/ml of DNase-free RNase and 40 μg/ml PI, and incubated for 1 h at 37°C. A total of 1.0 × 104 fixed cells were analyzed by FACS can (Becton-Dickinson, Franklin Lakes, NJ, USA). U251 cells were infected with Lv-shIFITM3 for 4 days, and the in vitro migration ability was determined using a Transwell chamber (Corning, NY, USA). Briefly, cells were seeded into the upper chamber of the transwell plates (8.0 μm pore, Corning Costar, Cambridge, MA) with 3.0 × 104 cells/well in 200 μl of serum-free medium, and 500 μl medium containing 10% FBS was added to the lower chamber as a chemoattractant. After incubation for 24 h at 37°C in 5% CO2, the cells remaining on the upper surface of the filter were removed, and those that invaded to the lower compartment were fixed with Methanol and stained with crystal violet. Cells were counted visually in 5 random fields under light microscope (10 × objective lens). In addition, invaded cells were dissociated, lysed and quantified at 570 nm using spectrophotometer. All data were expressed as mean ± SD of three independent experiments, in which each assay was performed in triplicate. The results were analyzed statistically using the chi-square test for the relationship between the incidence of immunoreactivity for IFITM3 and the histological grades using GrafPad Prism version 5.0. The Student’s t-test was used to evaluate the differences between the control cells and IFITM3 knockdown cells using SPSS 13.0 software. P < 0.05 was considered as statistically significant. To evaluate the role of IFITM3in human glioma, IHC was performed to analyze the expression levels of IFITM3 in 60 glioma patients (grade I:7; grade II:25; grade III:17; grade IV:11). According to the World Health Organization (WHO) classification, low-grade gliomas encompass grade I and grade II tumors with the least malignant phenotypes, while high-grade gliomas encompass grade III (anaplastic astrocytoma, anaplastic oligoastrocytoma, and anaplastic oligodendroglioma) and grade IV (glioblastoma [GBM]) tumor with the most malignant phenotype . Compared with the low grade glioma groups (Figure 1A and B), IFITM3 positive staining was mostly observed in high grade glioma (Figure 1C and D). IFITM3 expression level was increased with the histological grade of glioma (Table 1, P < 0.05). We also provided positive control and negative control in which the corresponding IFITM3 antibody was replaced by PBS, as shown in Additional file 1: Figure S1. These data clearly indicate that IFITM3 is specifically overexpressed in glioma tissues, and its high expression may contribute to the pathogenesis of glioma. Representative immunohistochemical staining for IFITM3 in patients with different grade glioma. A pilocytic astrocytoma (WHO I); B astrocytoma (WHO II); C anaplastic astrocytoma (WHO III); D multiple glioblastoma (WHO IV). Original magnification 200 ×. Human glioma cells of different transformation degrees, as represented by U373 astrocytoma (WHO grade III), U87-MG and U251 glioblastoma multiforme (WHO grade IV) were selected to detect IFITM3 expression. As shown in Figure 2A, high expression levels of IFITM3 were observed in all three cells. U251 cells, derived from a high-grade glioblastoma, were used for the following loss-of-function investigation. We constructed a lentiviral vector system to express siRNA targeting IFITM3 and to express GFP as a reporter gene. To determine the efficacy of recombinant lentiviruses, U251 cells infected with Lv-shIFITM3 and Lv-shCon were observed under a fluorescence microscope. More than 90% of the cells expressed GFP after 72 h infection (Figure 2B), which indicated high-efficiency infection by Lv-shIFITM3. To verify that the IFITM3 gene was silenced by Lv-shIFITM3, we determined the mRNA levels in uninfected, Lv-shCon and Lv-shIFITM3-infected cells by qRT-PCR. 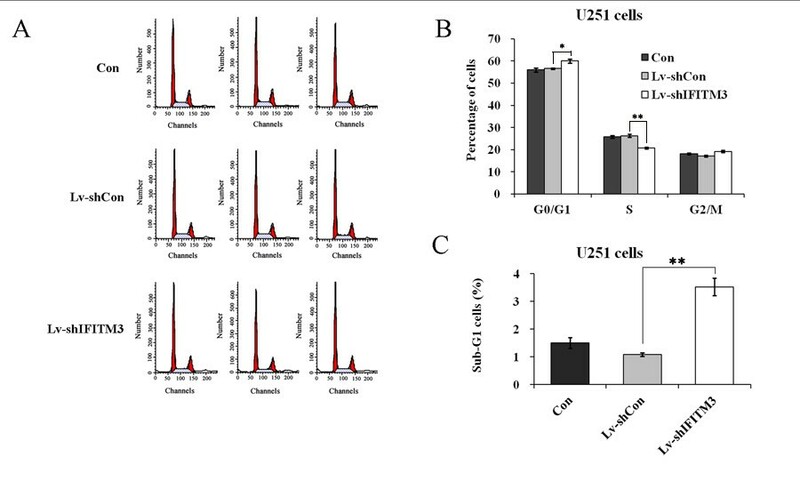 Cell infected with Lv-shIFITM3 exhibited significant decreased IFITM3 mRNA levels, by 84.8% reduction in U251 cells, compared with Lv-shCon-infected and uninfected cells (Figure 2C, P < 0.001). The similar result was observed in U251 cells infected with another two shRNA stargeting IFITM3, respectively (Additional file 2: Figure S2 A, P < 0.001). To confirm the silencing of IFITM3, western blot was used using IFITM3 antibodies. 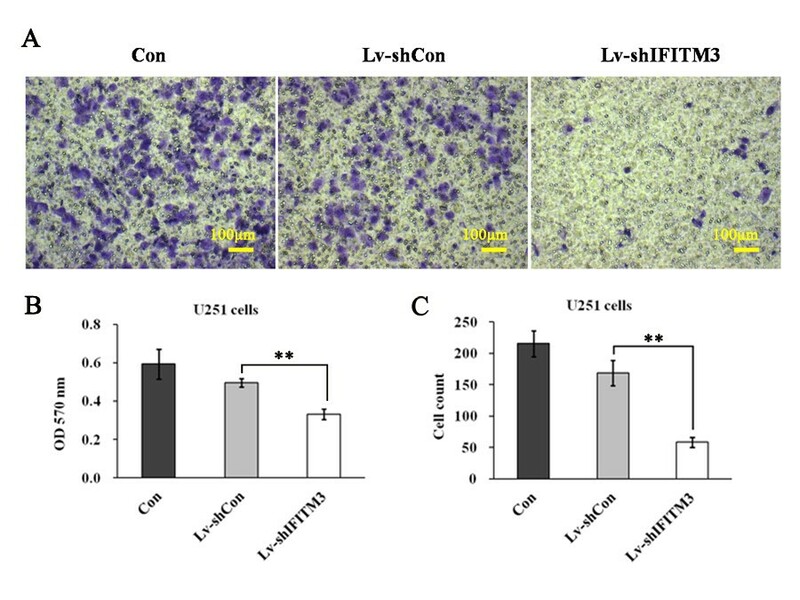 Compared with uninfected and Lv-shCon infected cells, the IFITM3 protein level was significantly decreased in U251 cells infected with the Lv-shIFITM3 (Figure 2D). Similarly, only weak band was detected in U251 cells infected with another two shRNAs targeting IFITM3, respectively, while the high expression of IFITM3 was not affected in cells infected with Lv-shCon compared with control cells (Additional file 2: Figure S2 B). Lentivirus-mediated gene silencing of IFITM3 in glioma cells. (A) Quantitative RT-PCR analysis for IFITM3 mRNA levels in U251, U87-MG and U373 glioma cells; (B) Determination of infection efficiency in the human glioma cells. Representive images of U251 cells after 3 days of lentivirus infection were shown (10× objective lens). (C) Expression analysis of IFITM3 mRNA by qRT-PCR in uninfected U251 cell (Con), cells infected with Lv-shCon, and cells infected with Lv-shIFITM3. The β-actin gene is the internal controls for qRT-PCR. Significant difference from Lv-shCon (P < 0.001). (D) Expression analysis of IFITM3 protein in uninfected group, Lv-shCon group and Lv-shIFITM3 group by western blot. MTT assay was performed to investigate the effect of IFITM3 knockdown on cell proliferation. The growth curve obtained from the MTT assay indicated that the proliferative ability of Lv-shIFITM3-infected cells was significantly decreased, by 55.2% reduction in U251 cells, when compared with that of Lv-shCon-infected cells (P < 0.001, Figure 3A). The similar results could be seen in Additional file 2: Figure S2 C, the proliferative ability of Lv-shIFITM3-S2-infected and Lv-shIFITM3-S3-infected cells was significantly decreased, respectively. These results indicate that knockdown of IFITM3 by RNAi could inhibit the proliferation of glioma cells. Lv-sh IFITM3 infection inhibits the proliferation and colony formation of U251 cells. (A) In vitro proliferation assay of U251 cells without infection (Con), cells infected with Lv-shCon, and cells infected with Lv-shIFITM3. Cell proliferation in the Lv-shIFITM3 group was significantly inhibited, as demonstrated by MTT assay. Significant difference from Lv-shCon (P < 0.001). (B) Images recorded under light microscope and fluorescence microscope, representing the size and number of colonies in each group of cells. (C) Statistical analysis of the number of colonies with Giemsa staining. Significant difference from Lv-shCon (P < 0.01). To determine whether IFITM3 has any impact on the colony-forming capacity of glioma cells, colony formation assay was performed. Our data indicated that the number and size of colonies formed fromLv-shIFITM3-infected cells were strongly decreased, by 78.8% reduction in U251 cells, compared with Lv-shCon-infected cells (Figure 3B and C, P < 0.01), suggesting that the reduced expression of IFITM3 could significantly inhibit colony formation in glioma cells. To elucidate whether knockdown of IFITM3 inhibits cell growth by affecting cell cycle progression, we assessed the cell cycle distribution in U251 cells by flow cytometry (Figure 4A). As shown in Figure 4B, compared to control groups, cell population in the Lv-shIFITM3 group displayed a significant decrease in S phase (Lv-shCon 56.58% ± 0.36% vs 60.07% ± 0.90%, P < 0.01), and a significant increase in G0/G1 phase (Lv-shCon 56.58% ± 0.36%vs 60.07% ± 0.90%, P < 0.05). Accumulation of cells in the sub-G1 fraction was clearly observed in the Lv-shIFITM3 group compared to Lv-shCon group (Lv-shCon 1.09% ± 0.07%vs 3.35% ± 0.32%, P < 0.01) (Figure 4C). Taken together, these data suggest that IFITM3 could modulate cell growth via cell cycle regulation as well as apoptosis. Knockdown of IFITM3 blocks cell cycle progression in U251 cells. (A) Cell cycle distribution of U251 cells was analyzed by flow cytometry. (B) Compared with Lv-shCon, the population of cells in the G0/G1 and S phase were increased the Lv-shIFITM3 group (P < 0.05, P < 0.01). (C) Percentage of apoptotic cells showed a significant increase in the Lv-shIFITM3 group. Significant difference from Lv-shCon (P < 0.01). To detect whether knockdown of IFITM3 affects the migration of glioma cells, Transwell migration assay was performed to assess the proportion of U251 cells which migrated through polycarbonate membranes following 4 days of lentivirus infection. We found that IFITM3 knockdown reduced the number of invaded cells accounting for 65.5% reduction in U251 cells (Figure 5A and B, P < 0.01). 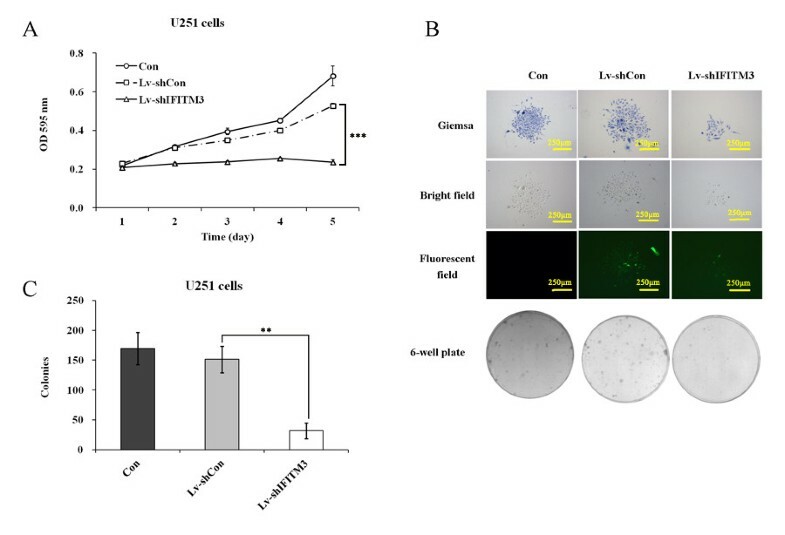 In addition, the colorimetric assay showed that the motility capability of U251 cells were retained after Lv-shIFITM3 infection (P < 0.01, Figure 5C). Lv-sh IFITM3 infection induces reduction in migration capacity of U251 cell. (A) Images recorded under light microscope, representing that IFITM3 knockdown could reduce the motility of U251 cells. (B and C) Statistical analysis of OD570 and cell count in U251 cells after Lv-shIFITM3 infection for 4 days. Significant difference from Lv-shCon (P < 0.01). Glioma is triggered by a series of point mutations and genetic alterations that progressively cause normal cells to transform into precancerous cell which could become more dysplastic, resulting in carcinoma foci . At present, the identification of useful markers for the diagnosis of human glioma is a major goal in cancer research, which also provides valuable information in tumor pathogenesis. We analyzed the expression of IFITM3 in human glioma specimens by immunohistochemistry and found the expression levels of IFITM3 were up-regulated in varying degrees and positively correlated with glioma of pathological grade I ~ II and III ~ IV (P < 0.05). Meanwhile, recent studies have also shown that IFITM3 plays a prominent role in tumor development and can be used as a tumor biomarker [21–25]. However, the precise role of IFITM3 in glioma pathogenesis remains unknown. In recent few years the discovery of RNAi, a powerful tool to induce loss-of-function phenotypes through the posttranscriptional silencing of gene expression, has provided new possibilities for cancer therapy [28–30]. In our study, lentivirus-mediated RNAi was used to knock down IFITM3 in human glioma cells. The siRNA targeting IFITM3, which expressed from the recombinant lentivirus, induced efficient and specific inhibition of endogenous IFITM3 mRNA in U251 cells. Simultaneously, depletion of IFITM3 led to significant reduced cell proliferation, colony formation and cell migration in U251 cells. Thus, this study confirms a crucial role of IFITM3 in glioma tumorigenesis, suggesting IFITM3 as an oncogene in human glioma. Moreover, cell cycle analysis indicated that knockdown of IFITM3 remarkably induced U251 cells accumulation in G0/G1 phase, especially in sub-G1 phase, which represents cell apoptosis . Together, IFITM3 may promote human glioma growth by inducing cell cycle arrest and apoptosis. Based on the IFITM3 belong to 2-transmembrane-domain proteins (5-18 kDa) with high core sequence similarity but divergent N- and C-termini, we suggest IFITM3 as a growth regulator in glioma, and it may be involved in the control of transport essential raw materials for DNA and enzymic synthesis process in cell cycle progression. However, some studies indicated IFITM3 plays an important role in inhibiting tumor development. For instance, El-Tanani et al. found that IFITM3 in breast cancer physically interacts with OPN and reduces OPN mRNA expression, which mediates cancer cell adhesion, cell invasion and colony formation. Similar situation has come under observation in human melanoma, and it is deemed dynamic promoter methylation adds an additional layer of complexity to the IFN-α key response genes like IFITM3 be required for comprehensive control of the IFN-α response [33, 34]. Therefore, we think the roles of IFITM3 in various cancers possibly depend on tumor growth microenvironment. Under normal physiological circumstances, IFITM3 could be in a balance regulating by different signal pathways. Furthermore, local invasion is one of the primary reasons for clinical treatment failure in malignant gliomas. Recently, there has been increasing evidence regarding specific molecules that determine the aggressiveness and invasion potential of high grade astrocytic tumors . In our study, we found IFITM3 knockdown significantly reduced the migration capacity of U251 cells, indicating that IFITM3 might play an essential role in glioma metastasis. However, further experiments are needed to elucidate the mechanism of IFITM3 in glioma cell growth and migration. To sum up, knockdown of IFITM3 by RNAi successfully reduced cell proliferation and migration, and promoted apoptosis in glioma cells. Our results provide new evidence for the involvement of IFITM3 in carcinogenesis, and suggest that RNAi-directed IFITM3 silencing may be a potent therapeutic tool in glioma. This study was supported by National Natural Science Foundation of China (Grant No. 81072066). BZ conceived, coordinated and designed the study, and contributed to the acquisition, analysis and interpretation of data and drafted the manuscript. HW and GZ performed the experiment and involved in drafting the article. BZ and PL accepts full responsibility for the work and/or the conduct of the study, had access to the data, and oversaw the decision to publish. All authors read and approved the final manuscript.